Not every support scenario has a customer at their computer. You can use BeyondTrust Jump Technology in two different ways, depending on your needs for unattended support. Use a Jump Client where the network may not be known, or if your unattended support needs are defined within a network, a Jumpoint is an effective solution. Read about the possibilities and configuration details for Jump Clients and Jumpoints. Unattended access to Windows, Mac, and Linux computers, regardless of network location. Stronger management capacities and the control of installing a persistent, secure active or passive remote access client. Privileged representatives may deploy Jump Clients dynamically from their representative console or download a mass deployable Jump Client from the /login administrative interface. The Jump Client is pinned to a Jump Group, thus enhancing administrative oversight and efficiency, benefiting from the robust management accommodations present throughout BeyondTrust. For example, customers who require unique support handling might be set up with Jump Client deployment to enhance administrative capabilities. A Jump Client Management interface in the representative console helps you manage your deployments. To troubleshoot all Windows systems in a network without pre-deploying BeyondTrust clients on each system prior to connecting. Access to SSH, Telnet, or vPro systems on that network, like servers, routers, POS systems or ATMs. To run Microsoft® Remote Desktop Protocol sessions while maintaining a consistent audit trail. The following terms and phrases are often used in reference to BeyondTrust's Jump Technology. Jump is the term for all BeyondTrust unattended access technologies. Unattended access refers to accessing remote systems without requiring interaction from a remote user to initiate the access. 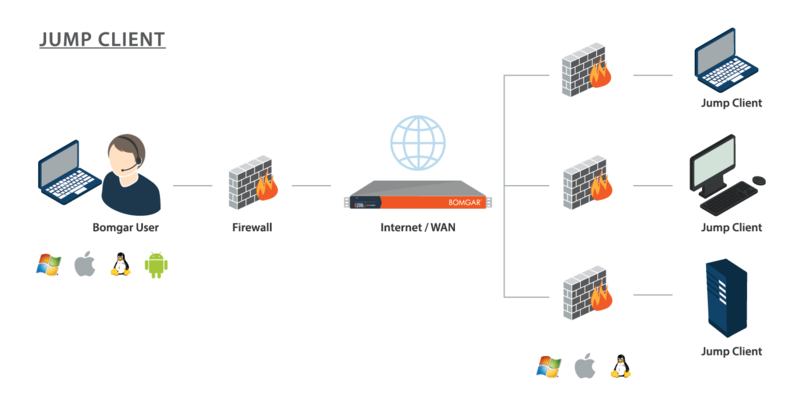 Jump Clients are used to establish a persistent, one-to-one connection between a Secure Remote Access Appliance and a remote Windows, Mac, or Linux system. A Jump Client must be installed on each remote system you want to access. The installed Jump Clients to which a representative has permission are listed in the bottom pane of the representative console. A Pinned Client is the same thing as a Jump Client, and a Pinned Session is a BeyondTrust support session that started through a Jump Client. For details, see the Jump Client Guide. Jumpoints create JumpZones out of the Windows network segment on which they are installed. A Jumpoint extends the reach of Jump functionality to the Windows systems in a JumpZone, enabling representatives with appropriate permissions to start a session with any remote Windows system in the JumpZone. The Jumpoint can be installed on a network remote to any representative or the Secure Remote Access Appliance. For more details, see the Jumpoint Guide. Local Jump and Local Push refer to Jumping from the representative console using the local network instead of a Jumpoint on a remote network. This allows a representative to initiate a BeyondTrust session with Windows systems on the same network segment as the representative console, without using a pre-installed Jumpoint. Except for the fact that no Jumpoint installation is required, the technical requirements and functionality for local Jumps are the same as for Jumpoints. Therefore, the Jumpoint Guide referenced above is the primary resource for local Jumps. Jump To, Push and Start, and Pushed Sessions refer to BeyondTrust sessions started from either Jumpoints or local Jumps, without distinction. Thus, a pushed session can refer to either of these technologies but not to Jump Client sessions or pinned sessions. Similarly, Push and Start and Jump To can refer to either Jumping through a Jumpoint or a local Jump but not to Jumping to a Jump Client.